We have made several large, community projects in our workshop space before. 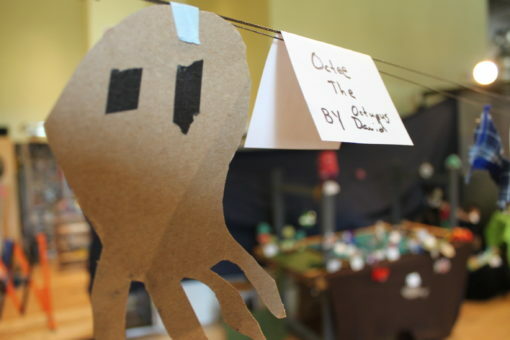 Visitors have helped to create cardboard cities, newspaper sculptures and forts. For our recent “Free Admission” day at the Museum (and to celebrate the beginning of summer) our workshop was transformed into an underwater aquarium. 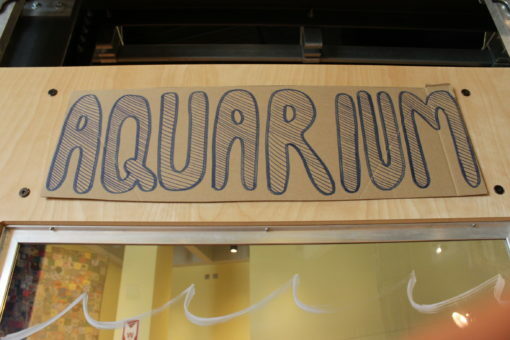 Visitors spent the next couple of days filling the aquarium with fish, sea turtles, underwater cars, mermaids, sea monsters and squids. 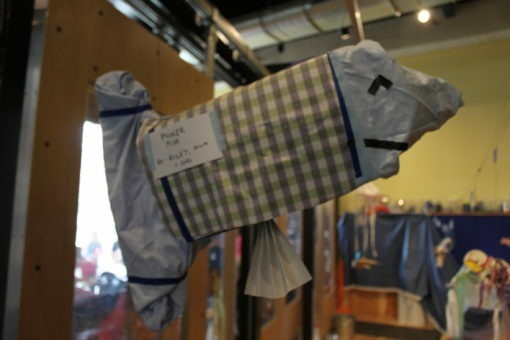 The creatures were made out of recycled materials and tape. 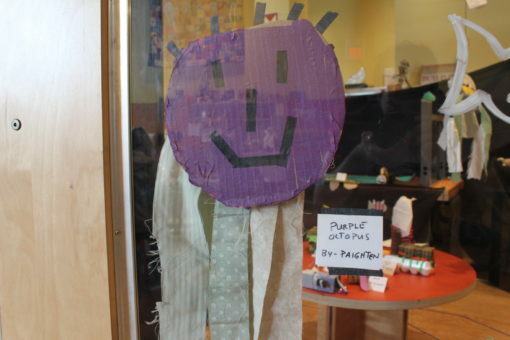 The creations were then put on display in the space for others to see. We made tags with the name of the creation and the creator. 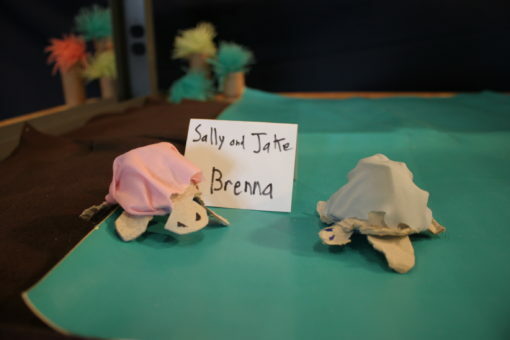 It is always good to give the participants credit when making a project like this. 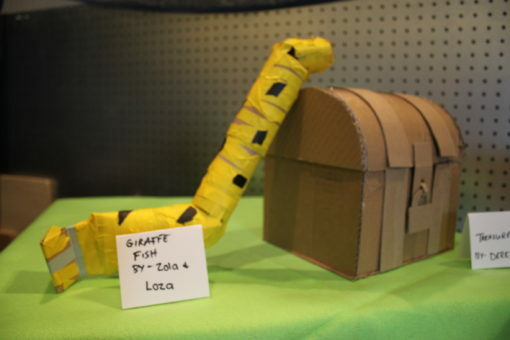 There were some really amazing creations. My absolute favorite projects are pictured below. The Purple Octopus with spiky hair. 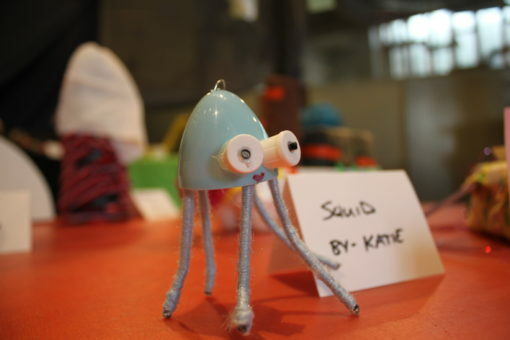 A simple squid made by Katie, the MAKESHOP Coordinator. There were a couple of new species created for this aquarium, including the Giraffe Fish. It was a lot of fun making this project. I love it when we transform the space. Even the littlest of kids had fun simply peering through the doors to the space to see all of the colorful creatures in the aquarium. These projects are always a blast. I can’t wait for the next one.